With a name like iPoint, you’d think this might be Apple’s own, new evolution of the pencil sharpener. That isn’t the case, but give the company some credit for creative name-branding. The iPoint Evolution Pencil Sharpener is made by Westcott. The name sounds high-tech and like Apple Products, the iPoint Evolution looked cool and innovative enough to make me take a second look. I’m still in the market for a decent, affordable, electric pencil sharpener and the iPoint caught my eye. Last year, while I was in search of the best electric pencil sharpener I could find, I was unimpressed with the ratings by actual users of the most expensive products on the market. At just under $30.00, the iPoint looks good and has the features I want, but how well does it actually work? Sadly, the iPoint pencil sharpener didn’t live up to it’s cosmetic looks and ergonomic hype. Out of 33 Customer reviews of Amazon users, the iPoint evolution only rated 3 out of 5 stars. The top two complaints seemed to be that the iPoint pencil sharpener either didn’t sharpen pencils evenly or didn’t make a sharp enough point. Considering the manufacturer, Westcott’s claim that the iPoint uses a precision, titanium sharpening blade, it is disappointing to hear that it doesn’t do a real good job sharpening pencils. The iPoint Evolution does feature an automatic shut-off feature when the pencil is sharpened, but unfortunately some users claimed it wasn’t very accurate. Other users seemed happy with the sharpening capability, but complained that they did not know how to empty the iPoint pencil shavings. With the number of iPoint users still struggling with how to do this, it deserves some brief instructions. The best way to learn how to empty the iPoint is to understand how not to do it: Do not attempt to remove the entire plastic casing or chamber from the iPoint. Some users have broken their sharpener by doing this. The iPoint’s plastic chamber is actually two pieces. Simply apply pressure to the top part of the plastic casing and gently twist and the lid will come right off. Some users complain it doesn’t provide a sharp enough point. Bottom Line: Should you Buy the iPoint? Having become a classroom teacher, I can give you a very honest opinion: If you’re going to be sharpening a lot of pencils, the iPoint Evolution pencil sharpener is not for you. I’ve gone through two of these in a year and I know a couple of other teachers who have had the same problem. Now, if you just use pencils at home to enjoy crossword puzzles or other individual creative hobbies, the iPoint is just fine for your needs and you should get at least a year or two of use out of it. For the money, it’s probably all you’ll ever need. Have You Ever Heard of Sellotape? If you don’t live in London, then Sellotape might be the very best adhesive tape brand you never touched with your bloody hands. How could something as simple as tape be an interesting review topic? Well, there are a few good reasons to talk about this particular tape: For one thing, most brands of tape in the U.S are made by companies which make multiple home-and-office products including paper, dispensers, scissors, staples, glue, etc, etc. The brand, Scotch sells far more than just Scotch Tape, yet Sellotape is to London as Scotch Tape is to the United States. Sellotape was invented in 1937 in West London and for some reason never found its way to the United States. For 74 years, Sellotape has focused on only tape and adhesive products. But before we talk about the full product line what makes their tape so special? Though I’ve yet to get my bloody hands on a roll of Sellotape tape, I’ve read enough about it to believe that it is a more robust, stickier and versatile tape than the typical roll of scotch at the home or office. As claimed on the Sellotape website, most users report that the “everyday” Sellotape taping product is easier to work with; stickier than most tape brands; doesn’t tangle or stick to itself and does a neater, more transparent job of taping things around the house. Users claim that the every day tape is unbeatable for gift wrapping jobs. One thing that annoys me about transparent tape is finding out where it unrolls. I like the fact that they offer a yellow-tinted every-day tape that goes on clear when it is used. So, what else do they have? Craft: Durable, two-sided, roll of adhesive tape and pre-cut, sticky-fixers foam adhesive pads for hanging pictures and mounting crafts, pictures and hobby displays. …and that’s about the extent of the entire Sellotape product line. As you can see, Sellotape emphasizes substance over quantity. For a company to be around this long selling such a limited variety of products, you know that Sellotape must be doing something right. No, you can’t walk into your local Office Depot, Office Max or Staples and expect to find the colorful, Sellotape boxes anywhere on their many shelves. But fortunately, you can still buy it online. Online and auction stores are great places to satisfy your need for a superior tape. You will find Sellotape in all of its varieties and forms: everyday tape; home-and-office; crafts and gifting – most of them with free shipping. So stop your Scotch fix and try something new for a change. Once you get your bloody hands on this fabulous tape, you’ll be sticking with it, forever. If you haven’t seen or heard of the name Swingline, you’ve probably never been to school as a child. Just about everybody has used a Swingline to staple a few pages of paper together or to attach a sheet of paper to a cork board. But, would if you need something that will handle more than a few pages at a time? You need a heavy duty stapler that is more of a home appliance. Various crafts and professional jobs require stapling of 10, 50, 100 or more pages at a time. If you’re writing a thesis or at a job where you’re producing several multipage reports a day, you don’t have the time for the hole-punch and folder routine each and every time. Wouldn’t it be nice to have a Heavy Duty Stapler that will put those pages together neatly and easily? A Heavy Duty Stapler is made precisely for those kinds of jobs and more. I’ve always considered Swingline Staplers to be heavy-duty, well constructed products and the Swingline Heavy Duty Stapler is no exception. Because I am familiar and comfortable with the brand , I wasn’t surprised to find that the Swingline seemed to topple other brands for satisfaction. You would expect such a heavy-duty stapler to be rather expensive, but they are surprisingly affordable. The price ranges from $39.95 to $49.95. In my research for a heavy duty stapler, The Swingline 160-Sheet Capacity Stapler seemed to be the most popular. I scanned through about 25 User Reviews on the Swingline 160-Sheet Capacity Stapler through various retailers and came up with an average rating of about 3 out of 5 stars. 3 out of 5 does not seem like a very impressive rating until you read the reviews on competing heavy duty staplers. You would think stapler construction and operation is a pretty straightforward technology, but this is obviously not the case. Other, higher capacity models of the Swingline brand line-up simply did not fare as well as the 160 Sheet Capacity flavor. Most of the complaints with the stapler had to do with difficulty loading staples, confusion over staple sizes; frequent jams and or failure to bind all of the pages together successfully. Poor documentation on the 160-Sheet version of the Swingline stapler was the number one complaint against it. Users appeared to be very satisfied with its operation and success in getting 100 page or more documents easily bonded together. I noticed that some office users complained that their Swingline wasn’t well suited for thick packages and other materials they attempted to staple together at the office. So, if you’re needing to do something other than straight-ahead paper-stapling, you might want to look at a different product; maybe a long-arm stapler, or even higher-capacity, more expensive heavy-duty stapler. Those who use the Swingline for stapling only sheets of paper rarely had any complaints with its performance. The biggest endorsements of the heavy-duty model is it’s solid construction and durability. The Swingline only gets an average score for it’s versatility and flexibility, but some of the reason for that appears to be based on some confusion over staple sizes. I’ll see if I can help with that. The Swingline heavy-duty model uses 3 Staple Sizes: 3/8″, 1/2″ and 3/4″. It is important to choose the right staple size for the number of pages in your document to be stapled. For instance, if you use a 3/4″ staple for a 100 page or less document, you will end up with barbed wired spikes sticking out of your pages. On the contrary, a 3/8″ staple won’t be sufficiently large enough to bind 60 or more pages of paper. Users complained that there was not sufficient documentation explaining which size staples to use. Let’s see if this helps. With some simple math, I’ve come up with my own recommended staple sizes for the 160-capacity model. DISCLAIMER: I claim not accuracy for the stapler capacities listed above, so use these as a ballpark estimate, only. 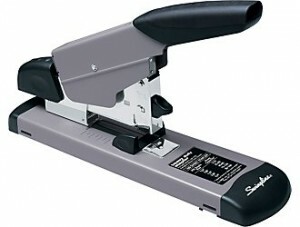 Just about any office store carries this version of the Swingline Heavy Duty Stapler. As mentioned, the 160-sheet capacity model is the most popular one. You should be able to find it at your local Staples, Office Depot, Office Max stores right along other competing brands such as Stanley and Staple’s own store brands. As usual, online shopping, gives you the opportunity to save a little more money on a Swingline heavy-duty model. There are some great deals out there. that I purchased from Office Depot a few years ago for $99.00 and it never felt good to me. Part of the problem with high back office chairs is that the arms get in the way of the slide out ledge where the mouse is used. The other problem with some high back office chairs like these is that they just don’t offer very good support and ergonomics for typing and mousing on your computer. My uncomfortable office chair would always cause me to lean forward, so I decided to find something better. I’ve found some things to keep in mind when shopping for an ergonomic office chair. I wouldn’t rule out high back office chairs; but make sure the height is adjusted so that the arms are level with your mouse and arm. The next issue is back support. You need to be able to reach your keyboard, mouse, telephone, pen and paper without slouching in your chair. Slouching is hard on the back and there is no reason that any office chair cannot be considered an orthopedic chair or ergonomic chair if it is built right. Furthermore, even an ergonomic or orthopedic chair can give you relaxation when you want to recline or lean back a bit. Whether you want an Ergonomic Kneeling Chair, High Back Office Chair, Orthopedic Chair or an Executive Leather Office Chair there are choices out there that are practical, affordable and still give you the support you need while you work at your desk. Let me list a few quality Office Chairs that will make you look forward to working at your desk each and every day – or if you’re a workaholic, even at night. The Aeron Chair, by HermanMiller is so artistic and advanced-looking that it has been placed in the museum of modern arts. Fortunately, you don’t have to go to a museum to enjoy the natural comfort of one of these chairs in your office or home. The Aeron chair uses innovative technology that naturally adapts to the body of every sitter. Also, if ecology matters to you, the Aeron Chair is 94% recyclable. I have yet to meet an Aeron Chair owner who isn’t 100% attached to this high quality product.